On Monday, September 24 members of the McQuaid Jesuit community gathered in prayer to remember and honor Tyler Conti ’21. 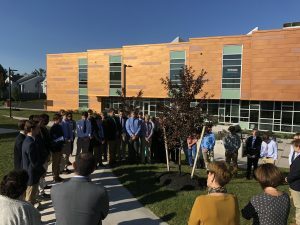 Led by the sophomore class officers, the prayer service was held next to a tree that was dedicated in loving memory of Tyler this past spring. The McQuaid Jesuit community was honored to welcome members of the Conti family as part of the prayer service. Eternal rest, grant unto Tyler, O Lord, and let perpetual light shine upon him. May the souls of the faithful departed, through the mercy of God, rest in peace. Amen.